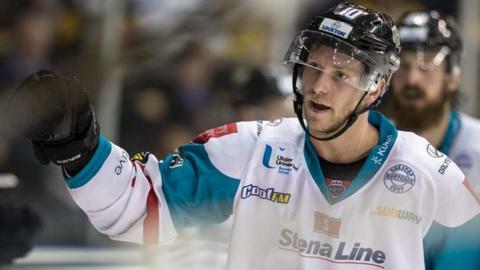 Belfast Giants came from behind to beat Cardiff Devils in a bad-tempered Elite League game at Ice Arena Wales. Patrick Asselin and Joey Martin gave Devils an early advantage, but Cole Jarrett replied for Giants. Andrew Hotham restored the hosts' lead, only for Giants to level the game as Matt Towe and Blair Riley struck. The visitors took control in a fiery third period that saw 13 players penalised, securing victory through Steve Saviano and Sebastien Sylvestre. Cardiff got off to a flying start, scoring after 40 seconds through Asselin's goal, assisted by Joey Haddad and Martin. Martin then turned scorer with a powerplay goal at 7:45, the referee awarding the goal despite the Giants' protests for offside. Jarrett cut the Cardiff lead in half at 16:01 when his thunderbolt of a slapshot ripped into the back of the Devils' net on the powerplay, assisted by Brendan Connolly. In the middle period, Andrew Hotham struck on the powerplay at 22:39, assisted by Martin and Jake Morissette, to extend the Devils' lead to 3-1. The Giants took advantage of their own powerplay opportunity later in the period when Towe redirected Colin Shields' pass into the hosts' net at 28:08. Eight minutes later and the Giants were level as Brendan Connolly dished the puck to the front of the net where Riley was waiting to shoot home. Saviano scored the visitors' third powerplay goal of the night at 44:33 when he snuck the puck from behind the net past Bowns in the Cardiff net. The Giants extended their lead at 54:14 when Saviano and Sylvestre combined well for the latter to shoot low into the Cardiff net. Belfast were without injured trio Stephen Murphy, Jim Vandermeer and Dustin Johner, plus the suspended Jonathan Ferland, who also misses Sunday's game in Coventry. Live scores, fixtures and results for Elite League ice hockey (external website). Live scores, fixtures and results for ice hockey Champions League (external website).